If you understand that ethics is a set of standardized rules for conducting yourself morally, then it’s easy to see that ethics is a lot like the tax code. It’s a system where people are looking for loopholes and shelters. They’re looking to get away with whatever they can while still staying within the rules. Ethics in busines is pretty much the same as it is anywhere else. It’s a code of conduct for a very competitive sport. No biting, no eye gouging, hit above the belt. High profile companies can be rocked by scandal for shady business practices just as easily as politicians can. And scandal for a company can hurt the bottom line. When you have dozens or hundreds or thousands of people out in the world doing business and representing your company, the only way to manage all of them is to apply a set of rules or ethics to a questionable situation. For small companies without high profiles, the boundaries of ethics are much easier tested and pushed. The repercussions are still there, but they’re limited without mass media exposure. True integrity comes from individuals. Integrity is a personal code of conduct that goes above the letter of good conduct and encompasses the spirit of good conduct. Your word is your bond. Your word is good. Your intentions are to create a win-win situation. People count on your professionalism and they know they can. Integrity builds relationships. It’s not who you know, it’s who knows you. Just as important, it’s how they see you. To conduct business at a high level requires people to have a lot of confidence in you. Serious business people understand the importance of good relationships and the role of integrity in forging them. Two companies can make each other stronger and worth more if they work together to make each other a success. You simply can’t do that if you’re playing the rules of ethics against each other. You can’t fake integrity but it is a great strategy. 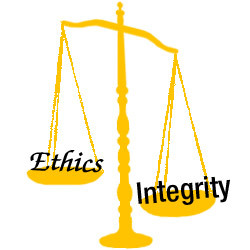 If you find yourself in a deal involving multiple parties, integrity will build your stake at the game over ethics any day. At least, it will when you’re dealing with serious and capable people. Integrity often loses when someone is selling something that isn’t real, and the other guy buys it. But that really isn’t a deal you want a part of anyway. I try to act with integrity as best I can with anything I get involved in. There is a time though when I like to get ethical. REAL ethical. If you’ve never been burned in business, you haven’t done much business. It happens. It’s going to happen. As sure as the sky is blue it’s going to happen. With time and experience you can learn how to protect yourself from getting burned or at least minimize the damage and the costs. With a little more time and a little more experience, you learn how to see it coming before it happens. That’s when I like to get ethical. I’m not going to do anything shady or immoral. I’m certainly not going to ruin my own reputation. But I won’t sit back and hope karma evens everything out either. When I get burned or I see it coming, I hit back. Most times when I see it coming I just walk away from doing business with that person or company. But if I’m already involved with them, I have to protect two things; the business and myself. The only thing to do is to stay within the confines of ethical behaviour, hit back, and hit back hard. i like this article. yes i like!